This week holds several well-known community tournaments like the Corsair Cup, hosted by BaseTradeTV, as well as the newly-partnered Korean Olimoleague tournament. The weekly dose of storybuilding continues in Korea for those who enjoy watching the most elite players in the world, and then. . . we have IEM Shanghai. IEM Shanghai, being held at Chinajoy (a massive Electronic Entertainment Expo w/ 250,000+ attendees), provides a unique opportunity for new viewers to check out StarCraft II. T the stakes are incredibly high for those competing as well. It is one of the last remaining events with over 5,000 WCS points available, and players like puCK, vioOLet, and MaSa would instantly earn enough points to pass the Global Finals Cutoff if they were to win this event. But will one of these trailing stars secure these points, or will an established top-contender like Neeb, Elazer, or Nerchio solidify their spot at the Global Playoffs by taking this event? This week is definitely an exciting one! 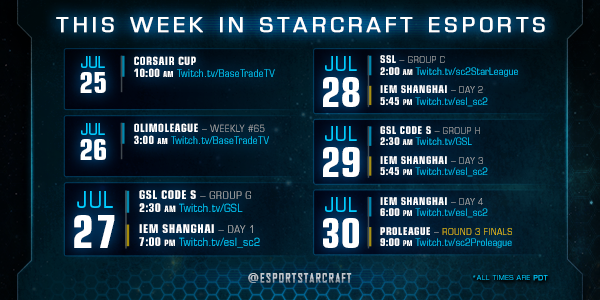 Hope you enjoy the events and be sure to check out our IEM Shanghai Survival Guide at StarCraft2.com!